Dow Jones went down 19 points ahead of the crucial September job report. All eyes on US job data tonight. If it is a positive job report tonight, then the Dow could trigger a breakout above the upper UTL (up trend line) channel. Wall Street traded cautiously, despite a positive 11k decline in the weekly jobless claims to 445k coupled with higher September's same-store sales numbers of 2.8% (consensus: +2.1%). The Dow dipped 19 points to 10949, ahead of the release of 1st Dow component stock, Alcoa result and the September job report (tonight). on higher demand in China, Brazil and India. Despite a dip on Dow overnight on profit taking activities, the positive Alcoa results and a drop in weekly claims in the US should provide cautious optimism to the local bourse and enable it to absorb any profit taking. On Wall St, the Dow is testing the upper UTL channel as broader sentiment remains firm following decline in weekly jobless claims and a positive Alcoa results. Immediate resistance levels are 11000-11100 whilst support levels are 10500-10600. 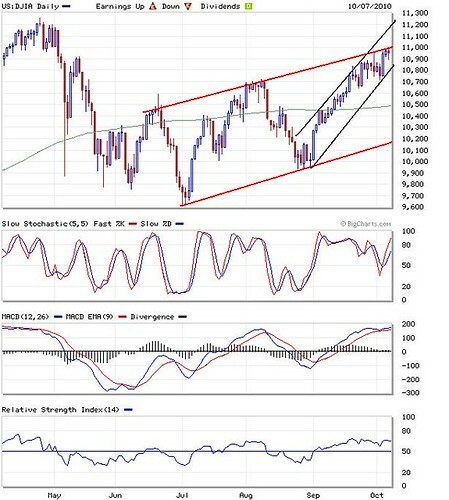 A positive job report tonight could trigger the Dow to a breakout above the upper UTL (up trend line) channel.